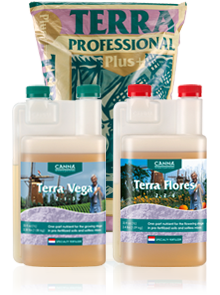 The special Terra Professional Plus formula was developed to fulfill the desire of creating the purest soil mix possible and to obtain the best effects with CANNA TERRA nutrients. 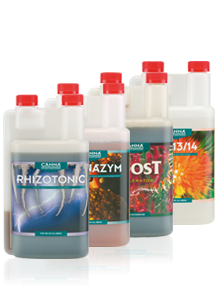 CANNA Terra Professional Plus is made up from raw materials each of which is the highest quality. Exclusive, high value ingredients such as airy peat moss and different types of tree bark (as a substitute for perlite) which have an antiseptic effect are components of CANNA Terra Professional Plus. These have a direct result in promoting exceptional root development and formation of thicker stems, while faster metabolism combined with low sickness rates ensure an increased production. It is enriched with special feeding mixes, containing all the elements plants need during their first week, meaning no additional feeding is needed at that time! The enzymes in CANNAZYM will ensure dead root-material is quickly converted into minerals and sugars. This is important because these elements form an important nutritional source for the plants and the soil environment. Also, rotting produces poisonous materials, which will be counteracted with the chance of infection by pathogenic fungi reduced considerably. In addition, a number of easily absorbable vitamins are added to CANNAZYM, which will encourage the plants into producing new roots. For these reasons CANNAZYM should be continually added to the feeding solution from the second week of cultivation, diluted at the ratio of 1:400. CANNA RHIZOTONIC is a powerful, vegetable based root additive. It causes extra root growth and, in this way, helps the plants to become established quickly. For this reason RHIZOTONIC is an ideal product for rooted cuttings and plants that need to be potted up, or for plants that have developed badly after being in a state of shock. RHIZOTONIC contains a wide variety of trace elements that are advantageous for the plant. The first 2 or 3 times you use RHIZOTONIC you should add it to the feeding water at the ratio of 1:250 or spray it on the leaves. CANNA PK 13/14 is a pure, high value mix of phosphorus and potassium that is given frequently during flowering. It is given to the plants along with the feeding about 7-10 days after flowers appear for about 10 days, adjustable for the grower and crop. During flowering the plants need extra phosphate (P) and potassium (K) and giving PK 13/14 will satisfy this need. PK 13/14 dissolves very easily and is immediately available to the plants. The results speak for themselves: higher yields and really substantial flower formation.